Home > Koreatown > Events > Another KTMF spectacle at Hollywood Bowl! Another KTMF spectacle at Hollywood Bowl! The Hollywood Bowl was a hotspot on a welcomed blue-skies Los Angeles day once more Saturday as it hosted the 13th annual Korea Times Music Festival, the oldest celebration of its kind in the United States. A sellout crowd, families and fans alike, came out to see more than a dozen acts — TVXQ, EXID, A Pink, Got7, Kim Bum-soo, Bada, Cool, Han Heejun, Kim Yon-ja, Kim Soo-hee, Oh Seung-geun, Im Tae-kyung — perform live on the historied stage, which has been home to American legends but also to K-pop stars of all calibers since the festival’s beginning in 2003. While the night was a return to the festival and the city for some artists, it served as a first step into the U.S. for others. “Just the fact that we can stand here on this stage is an honor and a great opportunity,” said Got7 member BamBam. 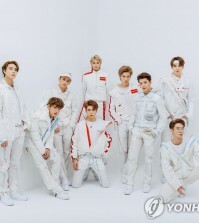 The group, which greeted their American fans for the first time Saturday, agreed they were nervous but that a positive crowd reaction, even from those of the older generation, made the experience a fun one. Kim Yon-ja, known as Korea’s Queen of Enka, had not been seen at the Bowl since 2010. “I wanted to enjoy the stage with everyone with songs that we can all sing along to,” she said after her performance, which fired up the crowd with old trot favorites. The ballad singer said Los Angeles is a dear city to him, especially thanks to its warm weather. 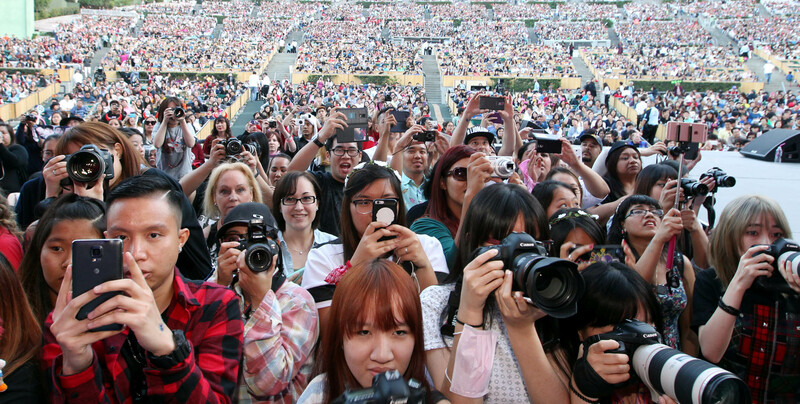 Meanwhile, fans from across the U.S. gathered to watch their favorite K-pop artists. Sisters Jamie, 20, and Holly Nuñez, 18, flew from Dallas, Tex., to see one act in particular, TVXQ. 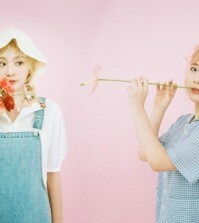 “We’ve been listening to K-pop since 2007 or 2008 I think,” Jamie said. Other fans seemed to have just recently gotten into the global craze. Nguyen and his friends, visiting from Hawaii for their first KTMF, struggled to explain why they liked the genre so much. For some it’s about the community and culture surrounding the music.